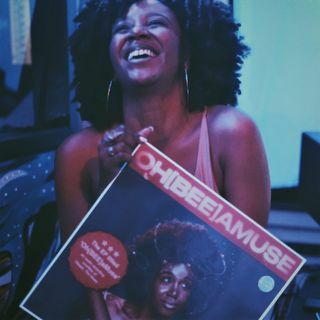 We’re joined by a talented spirit, Obeah the Muse (@obeahthemuse). Her music can be found EVERYWHERE by typing in Obeah, the Muse. TK is still out, but a very cute dog named Omelette joins us in the studio briefly. Obeah joins us, for a talk between creatives, discussing the origin of songs, time it takes to create, and how to do our best without second guessing. Following #ChatroomCheckIn, we stay on the power of growth. Obeah the Muse shares with us the power of enjoying the low and high frequencies of life. We are in the spirit of music and creating. Finally, Odeah sends us off with a feeling to do whatever we’re driven to. Go, create, make the day yours. day replays 7pm EST also available on Apple Podcasts, GooglePodcasts, Spreaker, and Spotify! If you really like us, leave a review on Apple Podcast that’d be really cool. 15:44 #GUEST: Obeah the Muse is in the building!